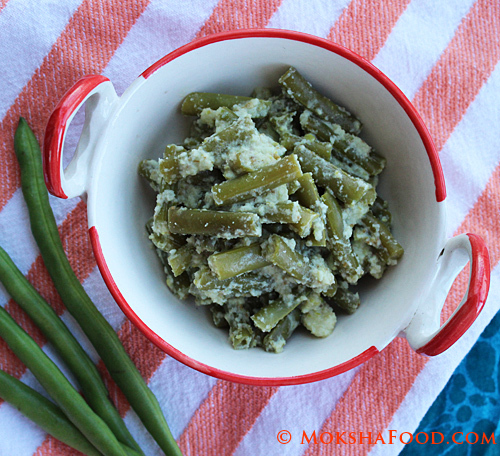 French beans are not a favorite in my house. I usually smuggle them in vegetable pilafs or mix vegetable stir fry. The only way my family really enjoys them is by way of French bean fritters. But frying every vegetable is not the way i want them to enjoy it plus its not the most healthy option. I wanted to experiment cooking the beans in tangy way. This is a very simple recipe with just about 5 flavor ingredients. Plus its a zero oil recipe. I just eye balled the ingredients so feel free to add more or less. I am very happy to say that my family enjoyed it making it a success. The heat from the chili and garlic paired with the tangy yogurt very well. Coconut added some sweetness into it. Cumin seeds gave a nice depth of flavor. French bean, washed, trimmed and chopped into 1 inch pieces. Steam the french beans till just done. 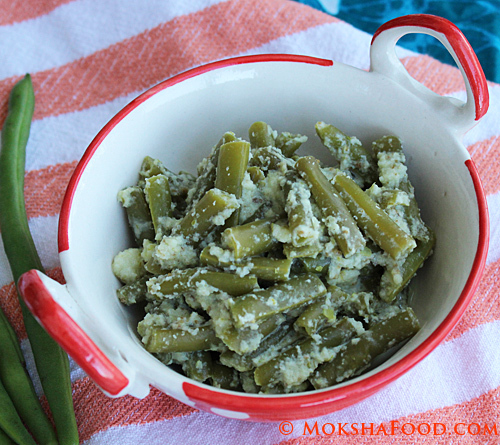 Blend together the yogurt, coconut, garlic, green chilies and cumin seeds to a smooth paste. Heat a saucepan to medium heat. Pour in the blended paste and saute for about 5 mins till all the raw smell is gone. Add in the steamed french beans and salt. Mix well till the beans are coated with the paste and cook for another 2 mins. Serve hot as a side or with your favorite bread. We enjoyed it with rice and tomato sambhar (tangy lentil soup). Maple Pedas - Sugar Free Dessert! Gluten Free Gujab Jamun with Diwali Wishes! Date Walnut Balls / Ladoos! Feasting this Sunday on Goat Biryani!